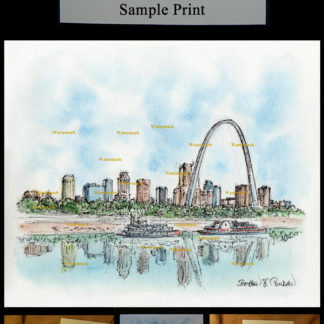 St Louis skyline #103Y watercolors • Condren Galleries Ltd.
St Louis skyline #103Y watercolors are metropolitan cityscape renderings with JPEG & PDF scans and prints by artist Stephen F. Condren, BFA-SAIC, of Condren Galleries, a Fine Arts Gallery. Because St Louis is large, it’s renderings are large. St Louis is the cleanest metropolis on the Mississippi River and is the gateway to the west. The downtown business district is so clean that you could eat off of the sidewalks.